More than $25,000 will be donated to the Easter Seals Rehabilitation Center of Evansville this morning, during Holiday World’s 21st Annual “Play Day” for the Tri-State’s children with mental and physical disabilities. Holiday World is donating the day’s discounted admission proceeds to the Easter Seals Rehabilitation Center, to be used to provide therapy for local children with disabilities. The admission price for “Play Day” is a $10.00 donation to the Easter Seals Rehabilitation Center. 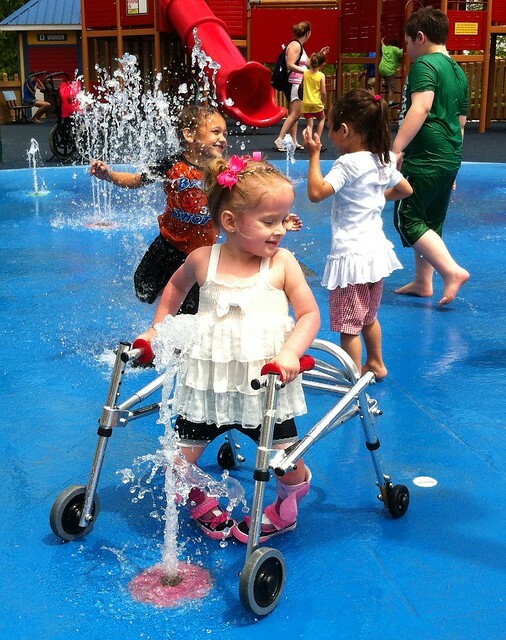 Holiday World annually publishes a Rides Guide & Information for Guests with Disabilities, in cooperation with the Easter Seals Rehabilitation Center, which describes the theme and water parks’ rides so that Guests may decide ahead of time which rides are suitable for them. These guides are available at Guest Relations, on the parks’ website: https://www.holidayworld.com/visit/accessibility-guide, or by calling the Holiday World office toll-free at 1-877-463-2645. Over the past 21 years, Holiday World’s Play Day has raised more than $308,000 for the Easter Seals Rehabilitation Center. Photo caption: Maddy from Boonville enjoys Play Day at Holiday World.